Our hassle-free process ensures that you will receive your vehicle in 10 minutes of less! It is as simply as 1, 2 ,3 exit the airport, grab your rental, and drive away to your destination. Easy to park and fuel efficient; this car will get you everywhere you need to go in SXM. find out more information about our deals and promotions going on right now. March 2018 was the first time we used Starlite Car Rentals and I couldn't be happier. The pick up and drop off at the airport was fantastic. We were out of the airport in the car and on our way in about 10 minutes. The drop off was just as easy. We will be returning in December with approx 14 people and will be renting 3 cars. I have all the confidence they will be just as efficient as they were with just one rental! 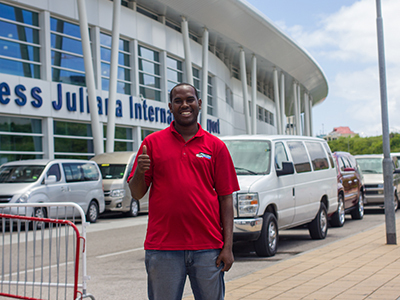 The SUV and the StarLite rep was waiting for us at Princes Juliana airport upon arrival. And to our surprise the rental had been upgraded with no additional charge. A week later we returned to the airport, met the rep in the parking lot, handed over the keys and without any delay we were on our way. Excellent customer service from start to finish. We will be using them again. We’ve been to st Martin several times and had always used the same company . Their customer service AND the cars they were renting we’re getting shabby so we tried Starlite . We were skeptical but the customer service for quite and e mail right away we’re fantastic ( I believe that was shareta Harris ) . I was crossing my fingers someone would be at the airport like they said and sure enough as soon as you walk out you can’t miss them with the logo on their shirt , leading you right to your car , quick inspection. , sign and go. Same as the way back . During the trip we exchanged for a bigger vehicle went directly to belair and shanyra was fantastic . Fantastic customer service ! We ll be back ! 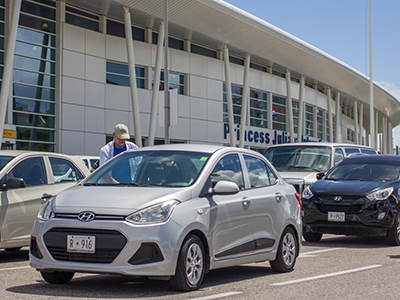 The SUV and the StarLite rep was waiting for us at Princes Juliana airport upon arrival. And to out surprise the rental had been upgraded with no additional charge. A week later we returned to the airport, met the rep in the parking lot, handed over the keys and without any delay we were on our way. Excellent customer service from start to finish. We will be using them again. Gracious, Helpful and Friendly, from my first contact. They were there to meet me. Helped with my Wife & Luggage. Ditto for when Returning the Car. The Car was waiting. The free Upgrade was nice. No problems for two months. Next Rental? No question about it....Starlite! Extremely pleased with their attentive service and their cars. I’ve rented from them twice this year and will continue to use them in March when I return. Highly recommend. Great service! Your vehicle is brought to you at the airport! No shuttle or lines. Best part is the airport drop off at the departure terminal. I always rent from Starlite when we make our annual visit to St. Maarten. They always provide great service, are timely and friendly. I once had a vehicle develop a vibration and they came to my hotel to exchange vehicles. I didn't have to do a thing. They took care of it all. I can't recommend them highly enough. I have been coming to SXM for many years and always grateful to see the good people at Starlite. They pick you up at the airport and help you with the luggage. No hassles and always a friendly face waiting to greet you in the terminal. That means that your vacation starts right away! Is it my birthday? No, but it feels like it when I see Zeke's smiling face! Great service and pricing. Straight forward with no frills. This was our first time to Sint Marteen and somewhat apprehensive about renting a car. Glad we did. You won't regret renting from these people. Its the no frills easy to rent with excellent front side and backside service. We took a taxi from the airport to BelAir Resort when we should have just rented from the start. Prices were $35 daily for a great little car. All of the cars are automatics but still found them strong enough to get up the steep hills. Its the relaxed feeling and trust they offer their customers that makes the difference. I checked my Credit Card over and over and nothing extra what so ever added. These are the type of businesses that will keep tourist coming back over and over. Great Job Starlite! We have been going to St Maarten for over ten years and always rent from ThriftySXM. During our last visit, we encountered a SERIOUS issue with Thrifty and will never rent from them again. A friend recommended Starlite. I am thrilled. All I can say is thank you Thrifty for your awful service. Otherwise we wouldn't have found this gem of a company. George, who met us at the airport when we arrived and when we left, was excellent. Everyone was very helpful and friendly. We will rent from them again, and again......!!!! 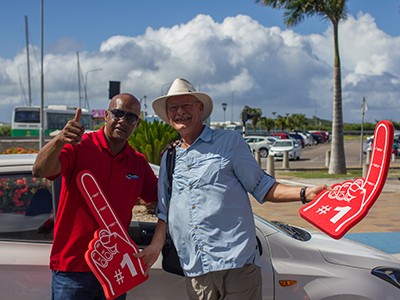 I have been coming to St Maarten for 35 years and always rented a car. This was my first time using StarLite and they were great. We were picked up at the airport and was very simple in getting the car. I will definitely use them again!!!! Super convenient if you’re staying at Belair Beach Hotel. We picked up our car at the airport very quickly and they were prompt to finish our paperwork and inspection when we arrived at the hotel. Car was clean and reliable. Very happy with the service. Personnel very accommodating, helpful and professional. Tina advised how to use local maps on my cell, places to visit. highly recommended. Fantastic rental company! They literally meet you at the terminal with your rental, quick inspection, sign and drive. A taxi from the airport to Philipsburg is about $40 so for the price of a taxi to and from the airport it’s a better deal to rent from Starlight. You drop your rental off at the terminal when you fly out. Couldn’t be more convenient and you have instant transportation. Parking on the island is almost always free and it’s easy to navigate. Do yourself a favor and rent a car while you vacation there. Starlite is the BEST on the island. We wouldn't even consider using anyone else. Off-the-charts customer service!!! Highly recommend. Starlite is the best Car Rental Folks on the Island - after a long flight the last thing you want to do is wait for a shuttle and then driven off site to only wait again. Starlite meets you at the airport to pick you up and you are on your way and then when you depart it is the same great door to door service. Love these Folks!!! George always take care of me. The price of our rental car for two weeks was very reasonable. Looking forward to renting from them next year. Thanks guys! Welcome to Renting Made Easy. At Starlite Car Rental we believe the process of renting a vehicle should be quick. easy and seamless. 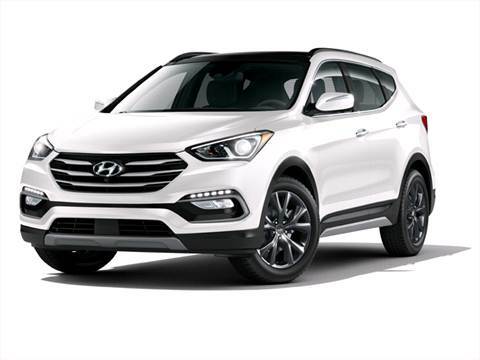 Our hassle-free process ensures that you will receive your vehicle in 10 minutes of less! Exit the airport, grab your rental, and drive away to your destination. “We are committed to our mission of ensuring no customer waits longer than 10 minutes to receive their vehicle upon arrival”. Our hassle-free process ensures that you will receive your vehicle in 10 minutes of less! Exit the airport, grab your rental, and drive away to your destination. When you arrive at Princess Juliana International Airport, we will be right outside waiting to receive you. We eliminate the extra stops and shuttle hassle. Free Baggage Assistance eliminates the inconvenience of having to rent a larger vehicle just to fit your luggage in the trunk. To begin with, our prices are matched against our competitors to ensure that you are receiving a fair price..
Once you rent a vehicle from Starlite, you receive free 24 hour road side assistance, which allows you to enjoy the ride knowing we are just a phone call away. Customers renting a vehicle for a period longer than two weeks can make an appointment at our office or online to have their vehicle cleaned at any time after their second week. Have Questions? Check out our FAQ section, we are glad to help you figure out the best way to rent and what works best for you and your family. Learn more about our Renting Procedure and see how easy it really is to get your car with Starlite. We have worked hard to streamline the process so you have more vacation time and less hassle.